Koy McAllister holds Elmer, his Rex bunny. Trapper McAllister holds his lop, S’more. RONAN — Wearing white shirts and black jeans blinged up with sparkles and glittering belts for the girls, 4-H kids either held their bunnies or placed their furry projects into small carriers during the bunny show on Aug. 2. Moms and dads, grandmas and granddads and friends crowded the grandstands as rabbit judge Cindy Arnot worked her way through the classes. 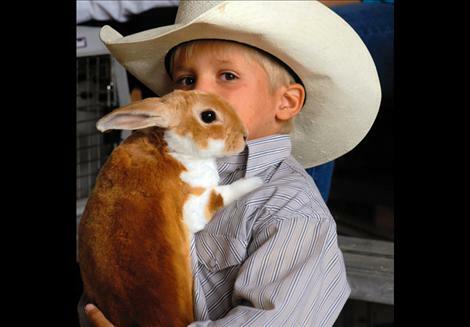 Koy McAllister, 6, held Elmer, his Rex bunny, and waited for his chance in the show ring. Both Koy and his older brother Trapper had bunny projects. Trapper sat beside Koy with his lop, S’More. “We feed them rabbit food and hay,” Koy explained. 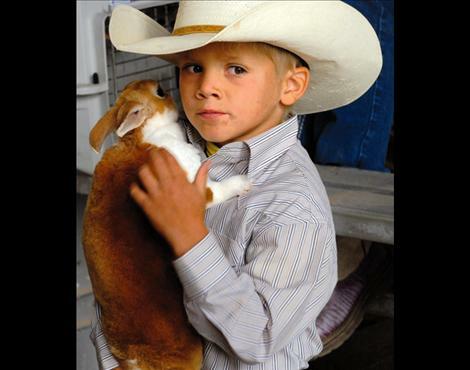 The boys may show pigs, sheep, steers and horses when they get older, but bunnies are a great beginning project.